There were a few symptoms/problems when I first got to listen/look at the amp: extremely noisy output from the “effects” input channel, mostly hiss/static rather than 60Hz hum (the “clean” input channel worked OK, no noise. 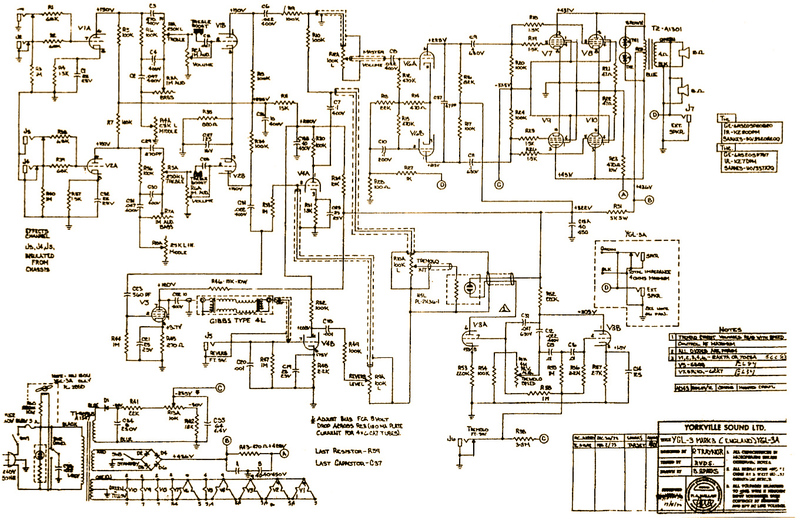 ), and the crucial reverb effect (crucial to Neil Young, anyway, and many lesser-knowns) wasn’t working. The noise was bad enough that the amp effects channel really wasn’t very usable. A couple of safety items to note first in case you end up working on a similar unit yourself: these amps are big, HEAVY, and somewhat awkward to carry. Weight is around 60-80lbs, thanks mainly to the magnets on the 2 big speakers plus the hefty power and output transformers, so be careful lifting them. Fortunately Joedy brought the thing over on a moving cart. Second safety note: this ain’t puny low voltage solid state circuitry. This is serious-voltage tube equipment, with hazardous voltages for tube anodes and cathodes and elsewhere, sometimes stored in high voltage capacitors. Lots of electric shock hazards that one can get a dangerous jolt from, so Be Careful! Plus the tubes get HOT in normal use. 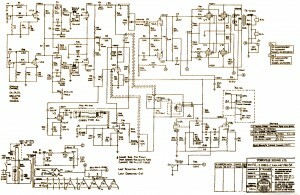 I take no responsibility if you decide to work on an amp like this yourself. 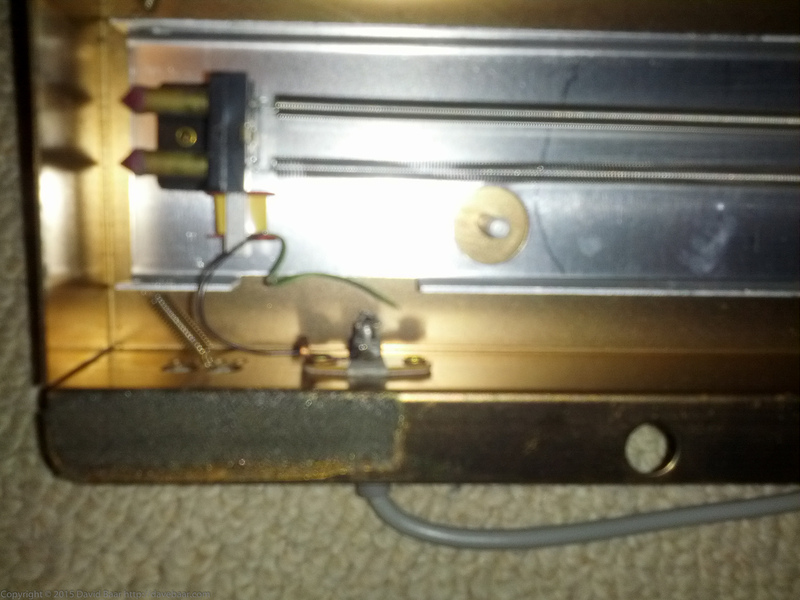 Quick resistance checks of the Accusonic (after disconnecting it from the amp circuitry) found Reverb unit input had continuity at about 165 ohms, but output side showed open circuit, apparently an occasional problem with these units. In this unit, I quickly noticed there was a visibly broken wire adjacent to one of the solder lugs on the output side connector. The fix was simply to solder a new connection to the lug. 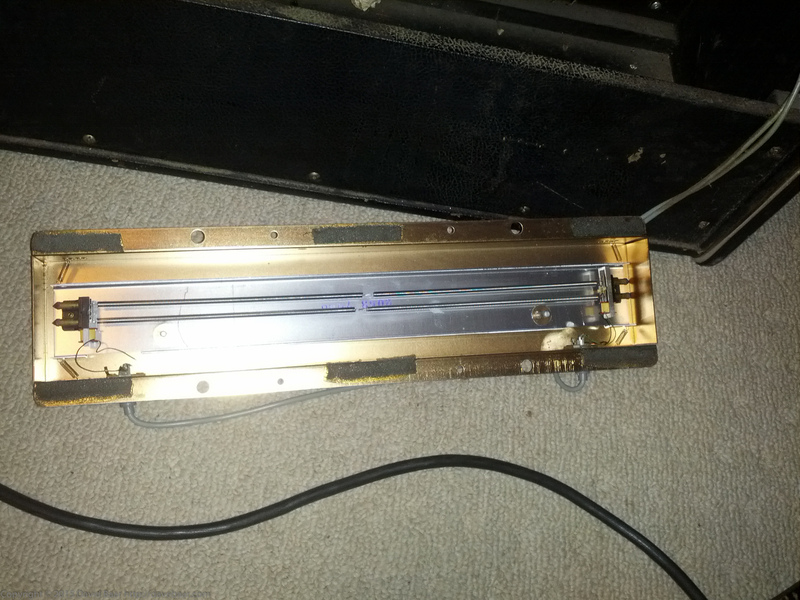 That entirely fixed the reverb problem. Now the Traynor has great reverb that Neil Young might enjoy. showed 2 potential problem areas on the effects side: the V4 and V2 tubes, both 12AX7A. One half of V4 is used in the Reverb, and the V2 is used in pre-amplification for the effects side. We had earlier tried a swap of the V4 with no success, so today I replaced the V2 tube with the one from my parts bin. Success! No more noise, and a great sounding amp. 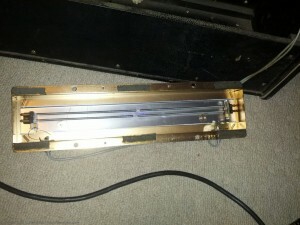 The tube in question was the 12AX7A/ECC83 dual-triode tube -a very common part in its day. I even had a couple of spares left over from repairs of my father’s hifi Dynaco amp that was from approx late 1960′s, that had been sitting in my parts bins for 30+ years; another case to help me almost justify my parts hoarding to my relatives. Finally, the master volume potentiometer was another source of noise when rotated – just a poor contact that needed cleaning. After applying some contact cleaner and rotating the control aggressively for a while to help the cleaning, that problem was solved too. 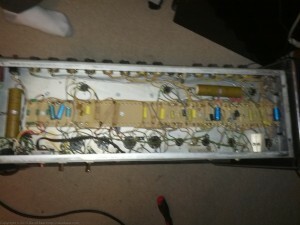 End result is an essentially fully restored Traynor YGL3 Mark 3 amp, now “gig ready” as Joedy describes it . A fun, relatively easy repair. Rock on! Hi Dave. I can’t thank you enough for making it possible for me to use my old Traynor amp. I’ave had it for around 30 years and it’s never really been playable but I didn’t have the heart to chuck it out. It was very exciting to be present while you diagnosed the problems and especially when each problem was corrected! High five!!! Since bringing it home, I’ve been playing it a lot and really enjoying the beautiful warm sound of the good ole Traynor tubes. It’s actually a fully gigable amp now! So good to keep something like this out of the landfill too! Thanks again my friend! You’re most welcome, Joedy. That was a very interesting repair. Thanks for that story, it will inspire me to bring my dear 1977 YGL3 Mark3 up to speed again, I´ve been playing it since early 80s and although it works a few more details like the things you describe need to be fixed (silent reverb for instance). 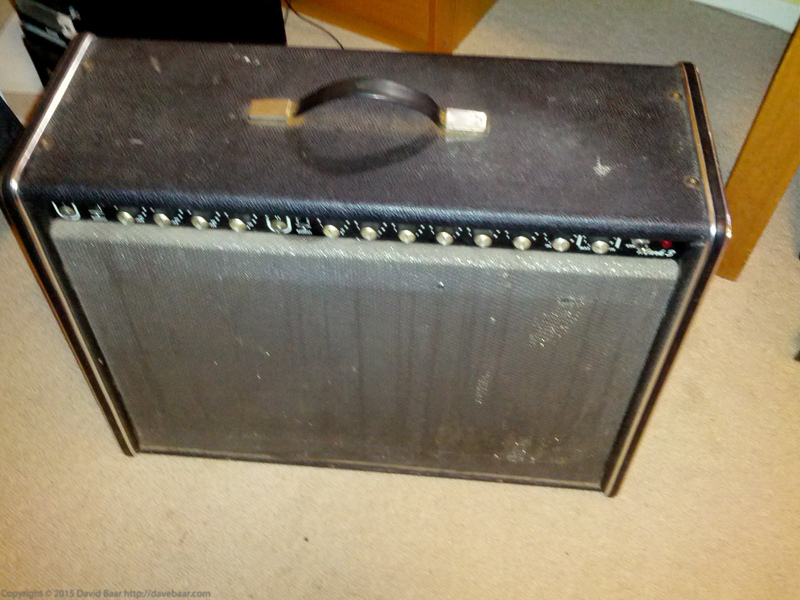 Luckily I´ve found a very well preserved used 1976 YGL3 Mark3 to keep gigging while the worn one is under treatment. Hopefully me and my son will have one functional YGL3 each in the end. I have one question: I´m about to get replacement tubes after 23yrs of use of the current ones. Do you favour any particular tube brand/model? Hi, Anders. You’re welcome. I hope that post was useful. Let me know if you have any additional questions. 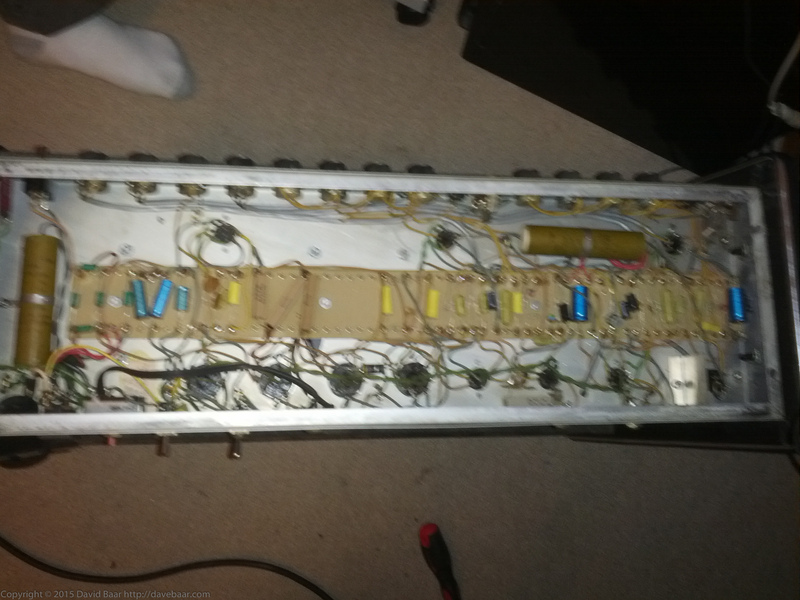 One additional thing I had to do recently to that same amp in this blog post was to replace most of the electrolytic capacitors with new ones. After some research, it turned out that Nichicon and Panasonic had among the best reputations as capacitor brands. I went with Nichicon capacitors, from vendor DigiKey, because the price was lowest. They work fine so far. I’ll email you this info too, to make sure you get it.